Yamaha 6AW-45974-20-00 Saltwaster Series XL. Diameter: 15 1/2 x 19. NOTE: Another prop pitch may be required for different load weights, water conditions, and other variables that affect performance. 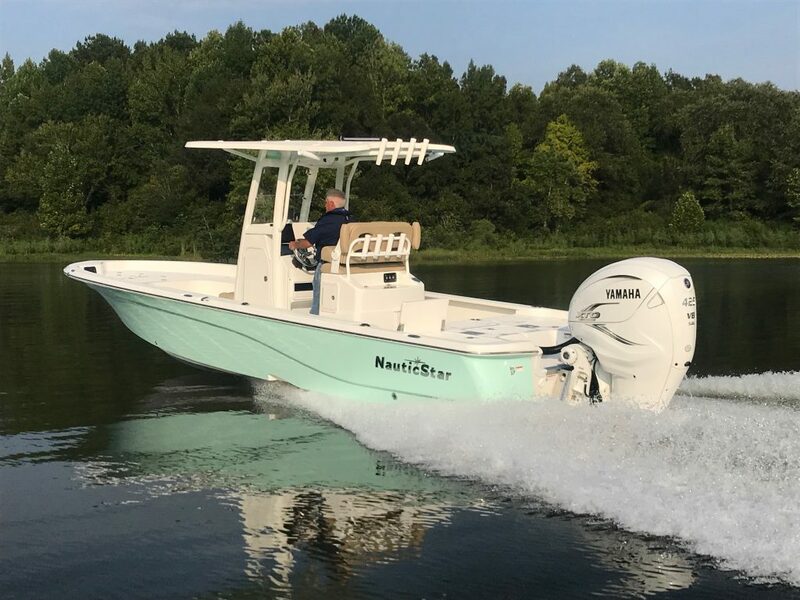 The helm station features a large dash with area for 2 - 12" displays, custom stainless steel wheel with power knob, Infinity PRV350 stereo, lighted stainless steel pushbutton switch panel, stainless steel drink holders, SeaDek® top with flush mount compass, and Yamaha® 6YC digital gauges. Shown with the optional Blackout Package and 2 SIMRAD® 12" touchscreen displays. The forward fishing deck is equipped with a variety of storage compartments for efficient use of space. 2 rod lockers with organizers for 10 rods, 43 gallon insulated fish box, 100 Qt. storage hatch in the step-up, and anchor locker. There is a 13 gallon livewell in the console seat. The newly designed leaning post features ergonomically correct Llebroc seating with flip-up bolsters, folding armrests, and footrest. The 265XTS can be rigged with the all new white Yamaha F425NSA2 motor package. This incredible groundbreaking motor by Yamaha V8 XTO Offshore® is smarter, more powerful and more efficient than anything you’ve seen offshore and features an electric steering system—an industry first. 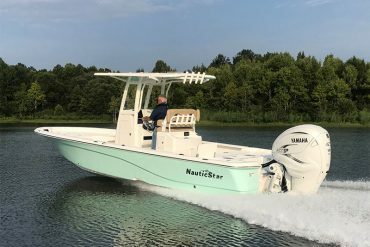 The aft fishing deck features 3-across jump seats, a starboard hatch with 35 Qt. YETI cooler, 42 gal. livewell in center hatch, and 137 Qt. storage hatch port side. 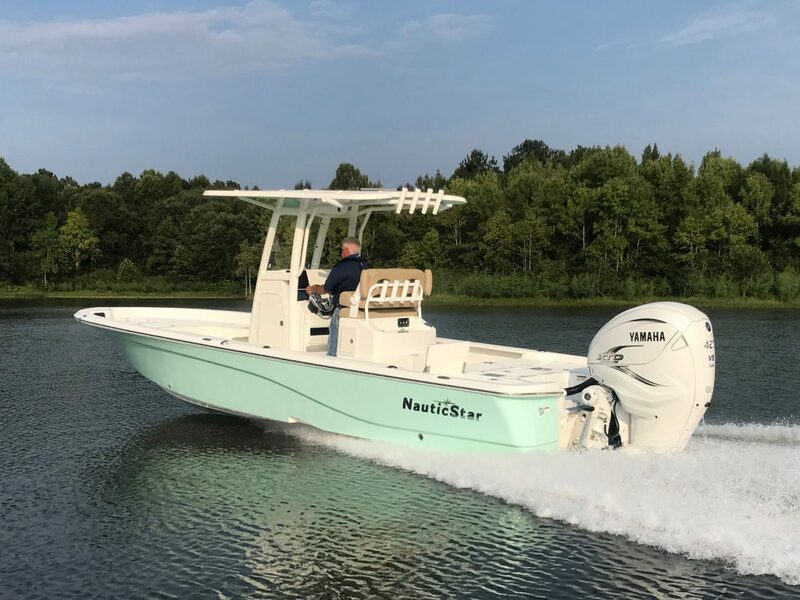 The starboard and center jump seats have Plano tackle storage below the flip-up seats while the port side jump seat has a cast net/bucket storage compartment. There are also 2 fishing seat bases provided. The comfortable helm seating has flip-up bolsters and armrests. The newly designed leaning post has a 21 gallon baitwell, tackle storage drawers, switch panel, conveniently located freshwater washdown, battery storage compartment, and rocket-launcher rod holders. 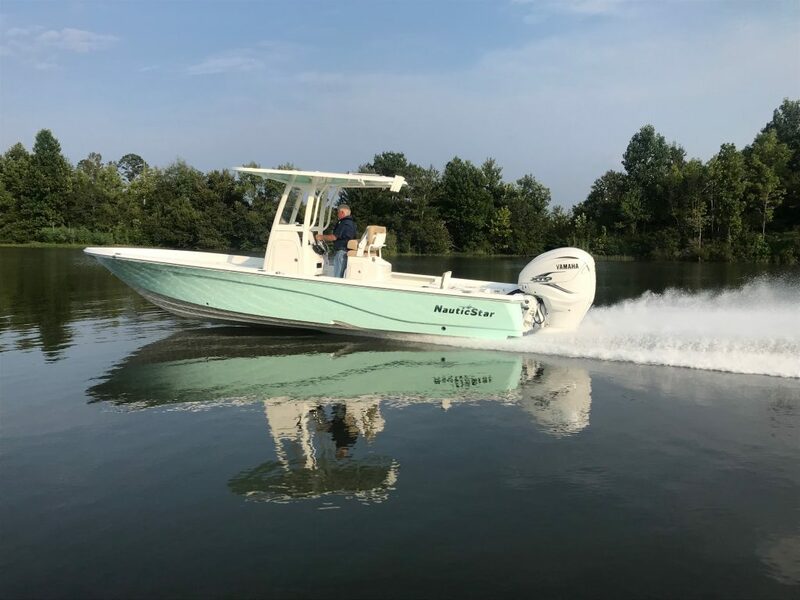 The aft fishing deck features 3-across jump seats with hatches for YETI cooler, storage and livewell. The new windshield design is integrated into the T-top frame. The top half folds down. The top of the console has SeaDek with a flush-mount compass.